Let's not forget, Morais and the rest of them denied for years that holidaying children had been assaulted in their beds - unthinkable, in the earthly paradise that is PDL! Then the truth came out, thanks to the PJ. That not only had children been attacked, the PJ had DNA from at least one of the attackers. Something else Gonzo 'forgot' to mention. That'll be like when she was mouthing off about 'suing' Amazon and the McCanns. And WTF is 'false light'? Why does she imagine she's been defamed? It's no-one's fault but her own that she ran her mouth off on telly and made an idiot of herself - again. I haven't forgetten her getting the boot from Fox, live, on air. RS: Do you honestly believe that Gerry McCann carried his daughter's body to the beach, hid her so well for three weeks, then moved it to a better hiding spot. How is that possible? PB: There are places easily accessible on a beach where you can wrap a body in a crevice and hide it well without anybody knowing. PB: Whether it was found originally, I do not know. RS: And do you really think the (highest) number of Portuguese police ever involved in searching for someone would not have found the body? PB: It's hard to know where they really looked. That's the whole problem. RS: It was their first time in Portugal, so how would they have known where to hide a body? PB: They'd been walking on the (beach) the whole time. It's possible they got lucky. 'Got lucky'? Didn't Bushmeat bother LOOKING at the beach when she went on her Ghoul Tour? I've actually just realised what a complete IDIOT she is. The local mutts would have smelled a weeks' old, decomposing corpse at the beach, never mind the wonderwoofs. Holidaymakers using the beach would have eventually been able to smell it, too. And then she thinks Gerry McCann carried this horrible, decomposing thing through PDL to the hire car? By that time, the whole of PDL would have been able to smell it - and the car would have been so stinky and contaminated, it would have to be scrapped. Again, no need for dogs. I am going to LMAO if she does sue for 'false light' or whatever - she's the one who voluntarily went on Aussie TV and made a fool of herself, after all. Oh yes, that was how she got nicknamed Bushmeat, wasn't it? She failed to grasp the difference between hot, dry, inland desert sand and soggy, wet, sand on PDL's tidal Atlantic beach. You know, one that has waves and stuff like spring and neap tides. She's a cheek calling herself a 'profiler'. I am still LMAO at Gonzo and Brown, Max. I wonder, have they both got so used to speaking to captive, adoring audiences, that they didn't realise that, to the rest of the world, they would simply look stark, staring bonkers? Madeleine McCann is the world's most famous missing person. Her disappearance ten years ago has been investigated by police forces in two different countries, but they came up with contradictory conclusions. 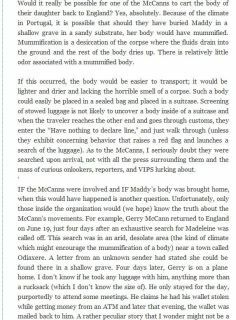 So what really happened to Madeleine in the Portuguese resort of Praia da Luz? Reporter Richard Bilton, who has covered the story for the BBC since the first days, examines the evidence and tracks down the men British police have questioned about the case. The hate squad needn't bother tick-tocking and assuming it's going to be the same kind of bullsh*t that Gonzo and his gang spout on CartofMuck TV. False light is a legal term that refers to a tort concerning privacy that is similar to the tort of defamation. The privacy laws in the United States include a non-public person's right to privacy from publicity which puts them in a false light to the public; which is balanced against the First Amendment right of free speech. Well, Bushmeat's had it, then, as she is very much a public person. She'd go to the opening of an envelope if it got her on telly - and remember when she was touting for work lecturing on cruise liners? It's no-one's fault but her own - she chose to run her mouth on Aussie telly. And pound to a penny, she agreed to terms involving editing her. "They edited it poorly. They edited it exactly the way they wanted to make me look - which was an idiot," Brown said. When has Bushmeat ever needed help to look an idiot? She manages that all by herself. In the Algarve, locals have taken to Facebook to vent their outrage, with comments boiling down to the perennial frustration that Praia da Luz has been presented as a form of village of the damned. Amaral too is certain to have a reaction to the fact that the remarks used by the station were not even made to Channel 7. But as the spin-cycle circus revolves ever more manically towards May 3 - when Madeleine’s tragic disappearance will finally reach its 10th year moment - observers put the hysteria into some kind of perspective. Hounder Donn can always be relied on to present internet gossip and tittle tattle from haters as 'news'. So she is still looking for money then? Horrible woman. Oh Lord, she's got herself in the Sun now. A CRIME expert who told an explosive documentary that Kate and Gerry McCann could have hidden their daughter Madeleine’s body plans to SUE the Aussie TV channel which ran the show. 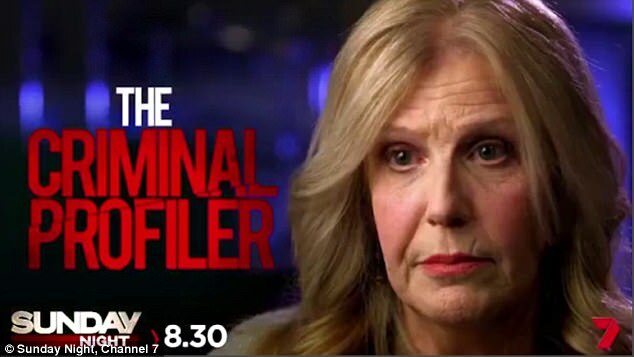 US criminal profiler Pat Brown featured on Channel 7’s Sunday Night show claiming the McCanns could have put Maddie’s body in a bag, hid it at the beach and moved it weeks later. But the expert – who told the show there was a possibility Madeleine had been killed as the result of an accident, neglect or abuse – now plans to sue for defamation as although she said it was possible, she never said the McCanns did it. Pat claims in her original hour-long Skype interview with journalist Rahni Sadler that she made it clear this was only a theory based on her view of the evidence available. Has the silly baggage 'forgotten' how she got the nickname BUSHMEAT? Has she 'forgotten' writing this? Her own blog is littered with outright accusations aimed at the McCanns. The internet itself is littered with endless examples of her vicious, false accusations and smearing of people. And her failed 'career'. Does she want all this read out in court? Because I am sure the TV station is quite capable of using Google and reading it all for themselves. Bushmeat won't be suing anyone. Just like last time. IMO. Oh.....I do hope that......she is not embarrassed by any of that? Would it really be possible for one of the McCanns to cart the body of their daughter back to England? Yes, absolutely. Because of the climate in Portugal, it is possible that should they have buried Maddy in a shallow grave in a sandy substrate, her body would have mummified. Mummification is a desiccation of the corpse where the fluids drain into the ground and the rest of the body dries up. There is relatively little odor associated with a mummified body. If this occurred, the body would be easier to transport; it would be lighter and drier and lacking the horrible smell of a corpse. Such a body could easily be placed in a sealed bag and placed in a suitcase. Screening of stowed luggage is not likely to uncover a body inside of a suitcase and when the traveler reaches the other end and goes through customs, they enter the "Have nothing to declare line," and just walk through (unless they exhibit concerning behavior that raises a red flag and launches a search of the luggage). As to the McCanns, I seriously doubt they were searched upon arrival, not with all the press surrounding them and the mass of curious onlookers, reporters, and VIPS lurking about. I would pay money to see that read out in court. Why are seemingly respectable people drawn to the cesspit that is Jill Haverns forum? Are they so desperate for attention that they don't mind having their reputations besmirched by hanging out with the hounders and haters. Because that is all that forum offers; contamination and indoctrination and a platform to spew hate, peddle lies and manufacture conspiracies. Oh, I do wish our Tony were here.